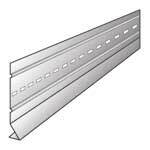 Provides straight line, true and level starter for lap siding. Universal for vinyl and aluminum siding. Galvanized finished for excellent corrosion resistance. Slotted nail hole spaces to allow for expansion and contraction. Hemmed edges and stiffener ribs help to maintain alignment.